Last month I asked you, my gentle readers, for your thoughts and advice about pre-employment assessments. 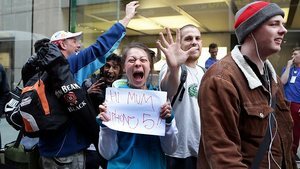 Well, y’all responded like apple addicts to an iphone release! And by that, I mean you responded in droves – not that you lost your cool for a little piece of plastic (see image at right). Be wary of how candidates will respond to testing. Several people reached out to say they thought testing is offensive. The best quote: “I presented myself with full résumé, work samples, extensive workplace references and case studies on previous work projects. If this evidence doesn’t trump a “personality” test that felt more like a word-plat game, then I am not their kind of guy because they are not my kind of employer/workplace.” Well said! Myers-Briggs Type Indicator (MBTI) – While not necessarily used as a pre-employment tool, the Myers-Briggs inventory is often used by organizations to assess talent. From Lyall Swim: “My experience/recommendation is two-fold. One it is important to remember thatthese assessments are not fool proof. They simply represent one more piece of data that can help inform the process and provide context. But to rely heavily on these assessments in making a hiring decision probably means you are walking away from some great candidates that don’t fit a profile test. The book “How to Lie with Statistics” helps outline some of the pitfalls of these test. In addition, here’s great recent article on the MBTI with respect to that: http://www.linkedin.com/today/post/article/20130917155206-69244073-say-goodbye-to-mbti-the-fad-that-won-t-die. And one group recommended against using an assessment called Profiles XT. The organization didn’t think the results offered enough insight to justify the time and money invested in them. Finally, you’ll remember that the theme of last month’s e-newsletter was my burning desire for an “eHarmony for hiring.” Well, apparently Neil Clark Warren can read minds; it turns out eHarmony is moving into the job search space! Misty Guard shared this article: http://www.inc.com/samuel-wagreich/eharmony-hire-your-soulmate.html.